Make the best day of your life better by being different. Here are some options that will up the classy quotient at your wedding without cramping your budget. Even if you don’t crave the big, fat Indian wedding, it’s almost certain that you want the day to stand out. While it’s natural to aspire for a ceremony that’s as individual as you are, budgetary constraints almost always herd you into opting for a ‘regular’ wedding. Aesthetics and exclusivity take a beating as the celebration is crammed into a banquet hall with flowers as festoons, Indian/Chinese as a culinary compromise and a boisterous DJ as entertainment. However, there can be more to the D-day if you plan and research well before the event. You can go for options that are classy and unique—and still fit into your budget. As a first step, you need to have a budget, which should be divided into different heads and each assigned a suitable weightage. These ideally comprise venue (10%), entertainment (10-15%), decoration (10-15%), food (20-25%), invitations (5%) and return gifts (5%). So if you have a Rs 10 lakh budget, you should spend Rs 1 lakh on venue, Rs 1-1.5 lakh each on entertainment and decoration, Rs 2-2.5 lakh on food and Rs 50,000 each on invitations and return gifts. Within this budgetary grid, let us consider the options that will make your wedding an occasion to remember in more ways than one. » Wedding insurance is a relatively new product. It provides cover for monetary losses at a wedding and also spans the pre- and post-wedding ceremonies. » It covers cancellation of a wedding due to fire or an accident met by the bride/bridegroom, and theft of jewellery or money, besides other eventualities. The sum insured can range from Rs 20-70 lakh. » The companies offering insurance include Bajaj Allianz Insurance, ICICI Lombard Insurance, National Insurance Company, Oriental Insurance Company, United India Insurance and New India Assurance Company. Invitation cards: At Rs 50,000 for 500 guests, you could dump the ordinary paper cards for handmade, rice or tissue paper cards. You could also go in for a customised card with a picture of the bride and bridegroom. “These take more time to print, but are more personalised and come for Rs 50-100 each,” says Ajit S. Rajdev, owner of Myshadi.cards.com. There’s also the option of scroll cards made from handmade silk paper and cost Rs 50 or more. The higher range, with inserts for ceremonies like mehndi and cocktail, come in a box. If you hike the budget to Rs 185-200 per card, you can pick the ones with imported glossy paper. Venue: Here is your chance to up the classy quotient without going overboard. Forego the standard banquet hall for a resort or a fort, even a palace. If you shell out Rs 1-1.5 lakh for 400-500 people, you can head for a resort like the Golden Hut resort in Gurgaon. There’s nothing like royalty to evoke romance. So for Rs 4-8 lakh, you can pick venues like the Ram Pratap palace or the Karohi haveli in Udaipur, even semi-private beach locations offered by hotels at Utorda, Cavelossim, Goa, and Kovalam in Kerala. The best bit? This budget will practically wrap up the entire wedding as all these places include décor, dinner and entertainment in the packages. If you have a bigger budget, you can choose the Neemrana fort in Jaipur (250 guests) or the Pataudi palace in Gurgaon (120 guests), which includes food, decoration and accommodation for Rs 10 lakh. Entertainment: If DJs are not your style, try live orchestra, which costs nearly Rs 20,000. “If they include a celebrity singer, the charges go up to Rs 1 lakh,” says Kanishka Verma, a Delhi-based wedding planner. Other unlikely options are belly dancers and bhangra troupes. The charges for belly dancers start from Rs 15,000 for four 20-minute performances any time during the wedding. A bhangra troupe costs Rs 20,000 to perform throughout the wedding. You can also welcome the baratis with shehnai players for Rs 5,000. Violinists are a good alternative and even charge lesser (Rs 3,000) than the shehnai players. For a slightly higher budget of up to Rs 1.5 lakh, you can get celebrity singers from reality shows like The Indian Idol in addition to the above mentioned options. Decoration: Do away with the traditional flowers and find a singular theme depending on your budget. For Rs 1 lakh, a village setting from Punjab or Rajasthan will certainly make your wedding a talking point. “If it’s Rajasthan, we play around with bangles, mirrors and puppets, and for Punjab, we create artificial wells, foldings and birds like peacocks. However, these themes work best if the wedding is in a villa,” says Verma. If you scale up to Rs 2-3 lakh, you can choose from ‘peacock’ or ‘shankh’ themes, even create a ‘Chandni Chowk’. You can also experiment with the jaimala stage by picking hydraulic (Rs 35,000) and revolving stages (Rs 15,000-35,000). Food: Being different can sometimes be as easy as replacing certain options in the menu. So instead of choosing from the Indian, continental, Chinese, Mughlai, Punjabi or Rajasthani food, you can drop some of these options and go for live stalls instead. And all this can fit in your Rs 1.5-2 lakh budget for 400-500 guests. 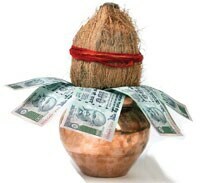 Besides, you can call in a popular paanwala or a cholekulchewala, who usually charge Rs 25,000-30,000. If your budget can be hiked to Rs 3 lakh, go for branded stalls from Pizza Hut, Domino’s, even Haldiram or Sagar Ratna. “Brands create distinction and guests prefer these,” says S.P. Sharma, a Faridabad-based food caterer. Return gifts: Sweets and money stuffed in envelopes are passé. For 500 guests at Rs 100 per person, you can pick silver coins, tea bags, candle-holders, music CDs, handbags or traditional items at Rajasthani stalls. At these stalls, for Rs 100-200, you can opt for gifts ranging from photo frames to saree bags. Not only will these improvisations leave your guests happy, but also set an evocative precedent.